On May 12, 2018 the Sullivan County Sheriff's Office (TN) will be hosting a benefit memorial ride at the Bristol Motor Speedway in Bristol, TN. All proceeds from the event will be donated to the National Law Enforcement Officers Memorial Fund in Washington, D.C. This event is an approved third party fundraiser by the NLEOMF. Erik Estrada has graciously accepted our invitation to lead this ride. 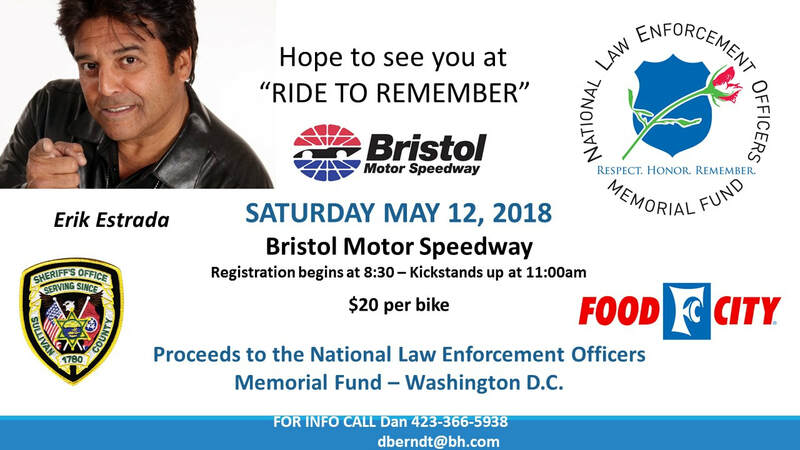 The ride will take place in VA and TN and will be an escorted ride departing from and returning to the famous Bristol Motor Speedway and will take approximately 1:20 minutes. We would enjoy having the BMW Riders Association members join us in this event to support our nations law enforcement community and honor those that have made the ultimate sacrifice. Please share with your friends and fellow riders and come out and join us honoring our nations law enforcement as we usher in National Police Week 2018.